Some people said shoes or purses or linens. Others said gloves or blankets or crockery. Me? 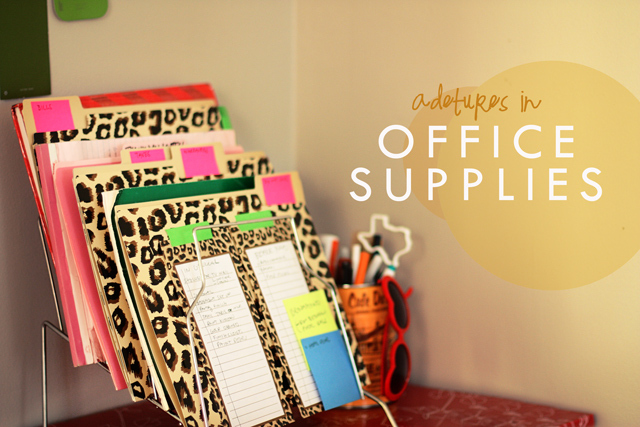 I like the office supplies. Yes, office supplies. 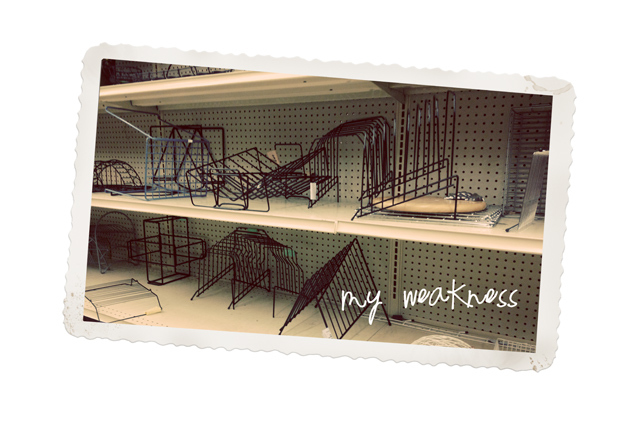 There is usually a whole isle of them in every thrift store and hardly anybody goes there. Most stuff costs a dollar (or less) and I always come away with something nifty. My favorite thing: paper sorters. All styles and varieties. Chances are, if there is a paper sorter in the store and it’s not covered in schmutz, it’s coming home with me. Don’t care where or how — I will find a ways to use it, goshdarnit. 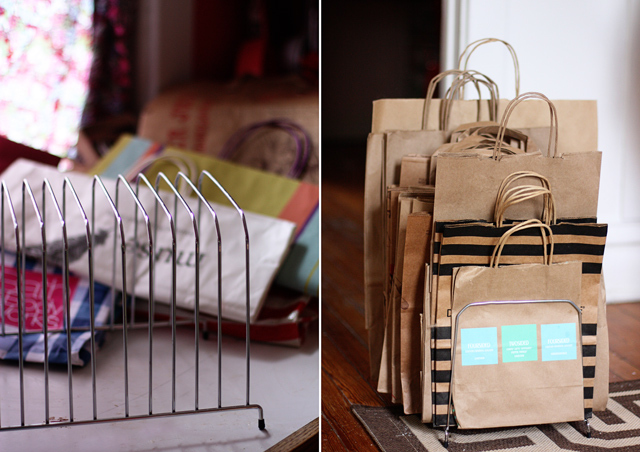 Since I am still not in my crafty swinging stride just yet, I thought I would whirl around the house this morning and show you guys a few of my paper sorters in action. This isn’t all of them, just the photogenic ones. Come by in person to rifle through my cupboards and you’ll find a bunch more. It’s like a family. Maybe a cult. A thrifty cult I can’t say no to. 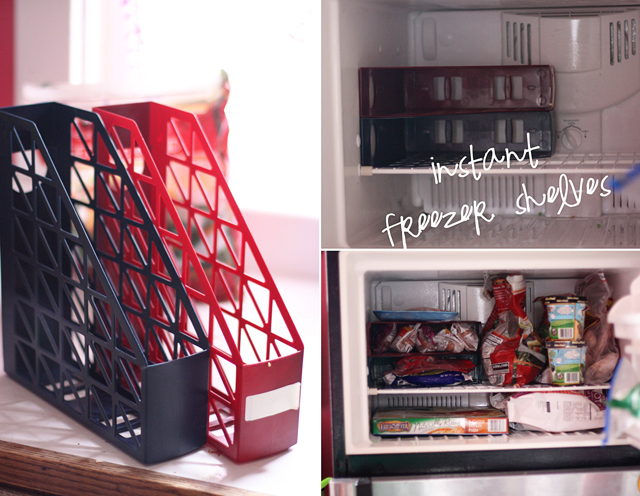 PS: That thing about the freezer shelves is especially handy for storing winter soups flat (see here). Okay. Now I have fessed up and told you what I can’t resist. Now it’s your turn; what is the one thing you can never pass up at the thrift store? Old stationery, old cards, etc. I love vintage cards, or cards with birds! I’m trying hard to not go crazy at thrift stores! I’ve got too much junk!!! But, I always look for vintage clothing I can refashion!! And ceramic owls I can spray paint. Old vintage t-shirts. I usually glom onto any nice flannel sheets, because we live at the rainy beach. I buy any cheap clothing with unique buttons. I also consider the coffee mugs. Then I scan the books for any interesting one. And I’m a sucker for any hand built pottery. And I’m always on the lookout for any smallish oil paintings, the weirder the better. 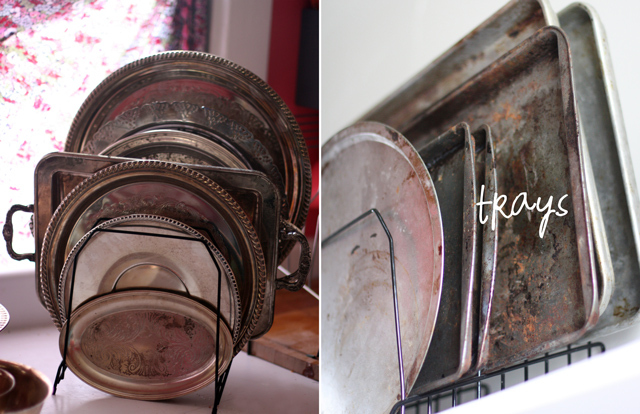 I read this the other day and then finding myself near 2 thrift store yesterday I couldn’t resist going in and checking out the office supplies– the tray and the ziploc bag/foil/etc storage ideas are great– but the selection in my town seems to be lacking. I have a hard time passing up on small wooden things I can paint (e.g. shelves, jewelry boxes), bird stuff, and creamer-sized pitchers. And nice tins. And… you get the idea. Uh oh — your local thrift stores need to look into their office supply selection. It’s usually one of the largest (and least looked at) at my local shops, which is probably why I like hanging out in that isle so much. China – I have two patterns that pop up regularly (Creative and Engagement). At this point, I could seat about 40 for dinner, no joke. Also, ties and chinoiserie. I will always buy underprices craft supplies or something home-decor that can be refreshed in a craft. I have to say, this is an eye-opener though! Paper sorters, huh? I had no idea. This HAS TO BE the single most ridiculous thing I’ve ever seen. Maybe if you got rid of some of your clutter you wouldn’t have a need go go buy MORE clutter to organise it all.. Seriously, you clearly just love the hunt because the items you show can already be found at a Dollar Store. I won’t even give you the feedback for whoever writes this mindless drivel.. I’m a writer and that point aside, my 8 year old could sound more mature and educated. WordPress tells me that this is comment number 13,826. Many of those comments have been unkind, but this might take the prize as the most rude. I have to ask you; what would compel you to take the time to write something like that to a total stranger? I mean, I might understand if it were a polarizing topic like abortion or religion or even say, sports. But paper sorters? I’m curious; do you leave these sorts of comments regularly or did I warrant special attention? This fascinates me. If you can’t say anything nice, then please do what Mom suggested and “not say anything at all”. I train my 8-year olds to have better manners than this! Also, Writer: actual, real writers don’t say “go go” and end their sentences with 2 periods. I hope your 8 year old can spell better than you…go go and organise ( organize perhaps). @Sutton- Your grammar is horrendous, I hope your 8 year old is teaching you a thing or two! I honestly feel terrible for the people in your life. I can only imagine that you’re a real blast to be around! Your comment is the most ridiculous thing I’ve ever read. 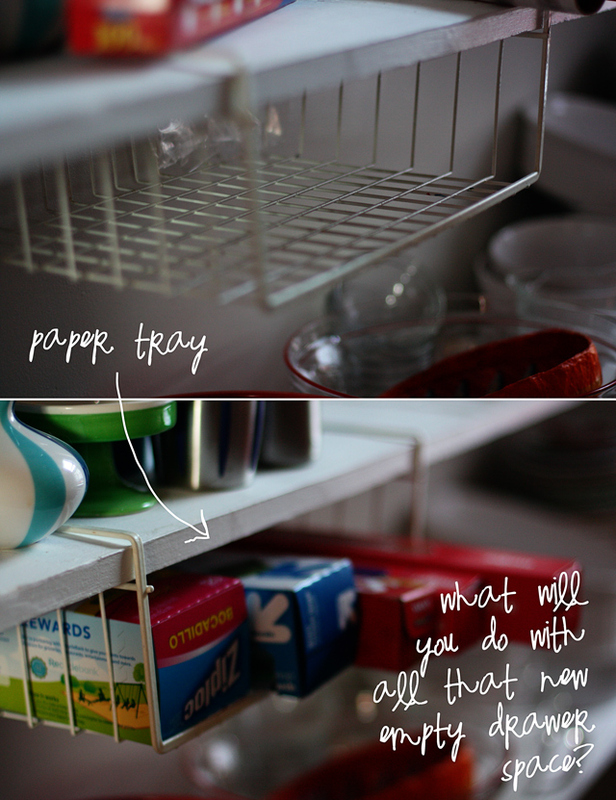 I have 4 kids, and I’m weird (according to my husband and kids) about being organized. I thought this article was great, and I’m glad that I am not the only woman out there organizing her drawers and cabinets! THE COMMENT MADE BY SUTTON REMINDS ME OF PEOPLE ON FACEBOOK. SAY ANYTHING JUST TO BE SEEN AND HEARD. I AGREE CAN’T SAY ANYTHING NICE SAY NOTHING. NO ONE MADE YOU LOOK LOL !! !